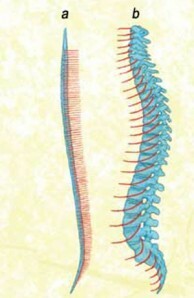 Nerves that control sensation and movement exit the spinal cord between the vertebrae in both sharks (a) and humans (b). This arrangement works fine in a fish, which is largely supported by water, or in an animal that walks on four legs, so that the body's weight is dispersed among front and back limbs. Humans, who walk on two legs, often experience severe pain or loss of movement when vertebrae in the lower back shift, or when the disks between the vertebrae change shape or rupture with age and/or disease. The descent of the gonads, particularly in males, creates a weak spot in the body wall. To envision what happens when the testes and spermatic cords descend to form a scrotum, imagine pushing your fist against a stretched rubber sheet. In this example, your fist becomes equivalent to the testes and your arm to the spermatic cords. The problem is that where once the rubber sheet was a simple wall, you’ve now made another space, between your arm and the rubber sheet, where things can slip. This is essentially what happens in many types of inguinal hernias in men. Some inguinal hernias, or hernias of the groin, are congenital, created when a piece of the gut travels with the testes as they descend. Inguinal hernia can also be acquired: A weak spot in the body wall—the muscular wall of the abdomen—can be breached, if pushed by a strong muscle contraction, and a loop of gut can be squeezed to lie next to the spermatic cord. Females are far tougher than males, particularly around that part of the body. Because females do not have a giant tube running through the abdominal wall, it is much stronger than a male’s. That is a good thing, when you think of the enormous stresses that female body walls go through during pregnancy and childbirth. Hurt your knee, and you will almost certainly injure one or more of three structures: the medial meniscus, the medial collateral ligament, and the anterior cruciate ligament. So frequent are injuries to those three parts of the knee that they are known among doctors as the “unhappy triad.” They are clear evidence of the pitfalls of having an inner fish. Fish do not walk on two legs. Rocks about 380 million years old preserve the first knees—in the pelvic fins of fish. They look like a simple hinge made of three bones. The animals that had them were mostly aquatic, so their “knees” didn’t bear much weight. Consequently, the fin is relatively flat and shaped almost like a paddle. Our legs look the same way when we are in the womb, at six to seven weeks of age. After about eight weeks of development, a remarkable thing happens: our knees rotate so that they face forward, flexing backwards. We can see evidence of this shift even in our adult bodies, where many of the nerves that supply the lower leg wrap backward at the knee. What does this mean in our daily lives? That rotation of our knees is essential to our ability to walk: imagine trying to amble about with your kneecap facing to the rear. It is also a prescription for disaster. Most of the weight of our body when we walk, run, and jump gets borne on a simple hinge. To make matters worse, the hinge is held together by a handful of strap-like ligaments, with two cartilage pads inside. Our “unhappy triad” is another example of the revenge of our inner fish. Looking back through billions of years of change, we see that everything innovative or apparently unique in the history of life is really just old stuff that has been recycled, repurposed, or otherwise modified for new uses. Human hands are a modified version of mammalian ones, which are ultimately modified fish fins. Bones in our ears originally helped ancient sharks and reptiles chew. The genes that control all of this structure were originally used to build the bodies of ancient worms, flies, and fish. Every part of us tells this story: our sense organs, our heads, even our entire body plan. While the evolutionary history we carry within us causes problems, it is also a treasure trove of potential solutions. 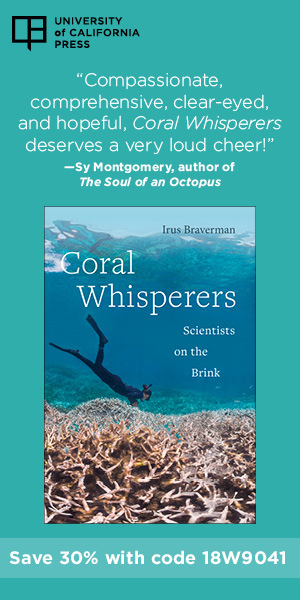 Answers to fundamental questions we have—about the inner workings of our organs, about possible cures for disease—will come from understanding how our bodies and minds have emerged from parts common to other living creatures. Already, the study of a little worm called Caenorhabditis has led to the discovery of a new mechanism for gene regulation. That discovery, for which the Nobel Prize was awarded in 2006, has spawned some of the most promising technology for tumor suppression and reduction ever discovered. If a cure for cancers is to be found, it will likely be derived from that little worm. 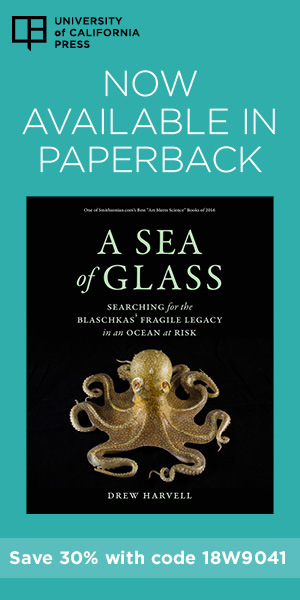 I can imagine few things more beautiful or intellectually profound than finding the basis for our humanity, and remedies for many of the ills we suffer, nestled inside some of the most humble creatures that have ever lived on our planet. This article was adapted from Your Inner Fish: A Journey into the 3.5-Billion-Year History of the Human Body, by Neil Shubin, © 2008. Reprinted with permission of Pantheon Books, a division of Random House, Inc. All rights reserved. Click here for ordering information. Devonian Times: “Fishapod” from the North!